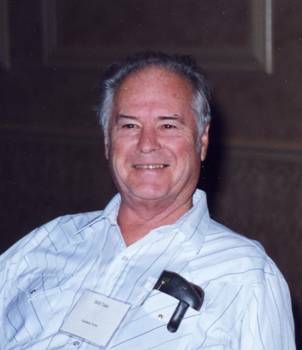 William E. “Bill” Teas, a native of Bellaire, Texas was born February 3, 1932 to Paul P. and Annie-Jo Teas and passed away December 19, 2009 at his home in Pearland, Texas. He was a member of the Teas Nursery family. Bill graduated from Lamar High School in 1950, the University of Houston in 1954 - the class that put KHUF channel 8 on the air. He married Oletia Booker on April 17, 1954. Bill served as a 1st Lt. in the Quartermaster Core at Ft. Lee, Va. He and Oletia moved to Galveston where he was a cameraman for KGUL TV, channel 11. When KGUL moved to Allen Parkway, he became the film editor at the same time he returned to U of H. In 1962 he went to work for AMF Tuboscope in the research and development department. He was the first operator of the Line-O-Log (smart pig) and traveled from Canada to Venezuela, England to Okinawa and Alaska and many back road places in the U.S.
After 25 years he retired and went to work for Oletia’s Ceramic ’N Art Company where he developed C ’N A Slip and Dinnerstone Slip. They retired in 1997. In 1999 they moved from Alvin to Country Place in Pearland. They traveled to England for genealogical research and a country dance tour. 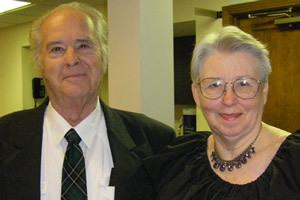 He was a charter member of Bay Area Genealogy Soc., Houston Genealogy Forum, and Friends of Clayton Research Library. He was the historian and a charter member of Houston Area Traditional Dance Society, Oxford Hall’s English dancers, Swinging Seniors Square Dancers, and Alvin Country Squares. Bill was the eternal joke teller and never so happy as when he could bring a smile to some one’s face and better yet make them laugh. He was an amateur clown. He is survived by his wife, Oletia B. Teas of 55 years and dancing partner of 61 years; son, Wayne and JoNell Teas; daughter, Adana and Gary Mutchler; granddaughters, Cassandra Teas and Amanda and Drake Smith; and brother, Joe and Wanda Teas. Memorial Services will be held at 2:00pm on Saturday, December 26, 2009 in The Carriage House at Country Place at 2620 McHard Rd East of HWY. 288. Dress is casual. Please send no flowers. In Lieu of flowers please make donations to Friends of Clayton Library 5300 Caroline, Houston, Texas 77004. Please note that any checks must be made out specifically to “Friends of Clayton Library” to be sure donations go to the correct destination. Condolences can be sent to the Teas Family in care of Jeter Memorial Funeral Home at www.jeterfuneralhome.com. AAFA NOTES: SSDI records confirm the birth and death dates of William Edward Teas (SS# issued in TX), last residence Pearland, Brazoria Co., TX. Folks who attended the 1999 meeting in San Antonio, TX, will remember Bill with his early version digital camera taking photos everywhere. His Alford lineage, from his great-grandmother: Christina Josephina “Jossie” 1860 Sweden4, Frank 1820 Sweden5. The following poem, posted at the HATDS website, was written by Barbara Moore and read at Bill’s memorial service on December 26, 2009. Meeting a gentleman by the name of Bill. Find a partner, Improper lines! Oh yes, he DID steal a look. He always told a joke or pun! We all knew as Bill.